a book chick: "The Silver Star"
"My sister saved my life when I was just a baby. Here's what happened. After a fight with her family, Mom decided to leave home in the middle of the night, taking us with her. I was only a few months old, so Mom put me in the infant carrier. She set it on the roof of the car while she stashed some things in the trunk, then she settled Liz, who was three, in the backseat. Mom was going through a rough period at the time and had a lot on her mind - craziness, craziness, craziness, she'd say later. Completely forgetting that she'd left me on the the roof, Mom drove off." 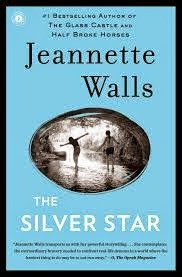 Jeannette Walls is a great story teller; after her own chaotic childhood and almost dying when she was 3 from her mother's neglect, she tells good hardscrabble tales. It's a tough life for "Bean" and her sister whose mother is overly dramatic, negligent, and self-centered, often leaving them alone for days as she seeks men or fame. When they decide she's been gone too long they go off in search of their family, traveling from California to Virginia. There they learn about who their mother is, who their fathers are, and how to confront their own inner demons and outer atrocities. my verdict: great read; if you haven't read any Jeannette Walls you're missing out! The Glass Castle (read before blogging) and Half Broke Horses are both worth a read. And for more on Jeanette Walls, here's a great interview from The New York Times.